Tower Arch Capital Recapitalizes Corbett Technology Solutions, Inc.
Tower Arch Capital has recapitalized Corbett Technology Solutions, Inc. (CTSI) in partnership with its management team. Headquartered in Chantilly, VA, CTSI is an integrator of communications solutions throughout the Mid-Atlantic region. CTSI designs, installs, and maintains audiovisual, sound, safety, healthcare, and education communications technology solutions for clients across multiple markets, including corporate, government, healthcare, education, senior living, multi-family residential, and houses of worship. "CTSI has a long legacy of success in the Mid-Atlantic, and I am proud of what our team here has been able to achieve since our founding 47 years ago,” said founder and president Chris Corbett. 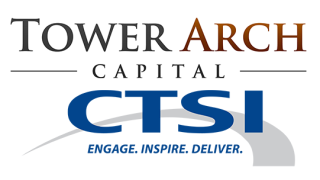 “For our customers, vendors, and employees, I am excited to partner with Tower Arch Capital to continue to grow CTSI within and beyond our current region." David Topham, partner at Tower Arch Capital, commented, "We are excited to build on CTSI's strong foundation and look forward to expanding their reputation as the provider of choice for complex audiovisual and communications solutions." Ryan Stratton, another Tower Arch Partner, added, "Chris has assembled a world-class management team at CTSI, and we are very pleased to work with Gino Ruta, John Farabaugh, and the rest of the team as communication and collaboration continue to become increased areas of focus for companies across every industry."